Esperanto accounts for more than 99% of all published material on interlinguistics, and probbably much more than 99% of the speakers of all constructed languages. Esperanto is identified by the green star, and that they have a flag, which could be blazoned «Vert, on a canton argent a star vert» (a green flag with a green star in a white canton). Green is certainly the colour of Esperanto. The Esperanto flag: green 2:3, white 1:1 canton with 0,35 radius green 5 pointed regular star pointing upwards centered on it. Esperanto organizations and individual esperantists use this flag as a general symbol of their language; variants defaced with organization names and slogans, written on the bottom half of the flag, are usual. Some organizations, especially those whose logo or emblem is based on the green star, put it on the canton of an otherwise unmodified esperanto flag (see particular variants). According to [rod97], both a star and the green color were associated to Esperanto quite early, following a call for it from B. G. Jonson, a Swedish Esperantist. Louis de Beaufront (who later become adept of Ido) proposed and initiated the usage of publishing books written in Esperanto with their covers green and with a star on it. The idea caught on and soon the green color and the star symbol were all over in Esperanto written books and periodicals. However nothing was fixed for the exact design of the star neither for its color — it was often golden, on the green background. In the website of the International Esperanto Museum in Wein, Austrian National Archives, there’s a facsimile of a poster inviting to the 2nd World Esperanto Congress, held in Geneva in 1906. It shows the esperanto flag as we know it. This is interesting because the design had been accepted only one year before, at the 1st World Esperanto Congress (1905, Boulogne-sur-Mer, FR). In Panorama in interlingua 2/1991: p.16 “Ab le archivo” [ial91a] black and white symbols of constructed languages from «our archive» (probably the image sources as for [rod97]? ), which I quote: (dates are language publishing, not symbol creation): «Esperanto, 1887»: large outlined star enclosing "esperanto" in arched capitals above smaller (filled) star; both stars are regular starry pentagons (alternating points colinear) pojnting up. Not really the emblem (which never changed), but a quite tacky offshoot variant. The Israeli Postal Authority has issued a stamp in honor of the 120th anniversary of Esperanto (1887-2007). At the bottom of the stamp — actually on the piece attached to the stamp, I don’t know the technical term — is the flag of Esperanto, but in the “large canton” version. The accompanying booklet gives the post-facto explanation [about five continents]. I’m quite sure that the Israeli stamp now issued is intended to represent the current esperanto flag, perhaps with an oversized canton and surely with the bottom of the flag “bleeding” out from the paper. Some organizations, especially those whose logo or emblem is based on the green star, put it on the canton of an otherwise unmodified esperanto flag. Christian esperantists of most denominations use Esperanto’s star defaced with a cross outline in pins and emblems. Some flags show this on the usual canton, with or without lettering in the lower fly. An exception to this seems to be left wing esperantists, on record for seldom usage of a regular esperanto flag with green star on the white canton of a red flag, instead of green. This may stem from the green star fimbriated red that makes the emblem of SAT (Sennacieca Asocio Tutmonda). Perhaps because the star is a very “plain” logo, easy to confuse especially in black-and-white medium, it is quite often to deface the star with a white upper case "E", of obvious meaning. This however is seldom done in flags, perhaps because the complete design (field, canton and star) is less confuseable than an isolated star. There are however some cases of flags with "E"-stars, some dating back to the earlier days of Esperanto, as the one above, from a photo taken in the II Esperanto World Congress, in Dresden (Germany), 1908. A 1975 article in czech vex. magazine Vexilologie 16 p. 180-181, 184 “70 let vlajky Universala Esperanto Aoscio” [klj75a], by Jaroslav Klement (available on line) reports the flag of Esperanto language, 70 years old by then. It is termed the organization flag of the Universal Esperanto Association (which, this being its most representative instance, is but a slight mistake). The article shows and describes unusual specs: A 3:5 ratio, against the official 2:3 of [n9l03]; and canton side only one third of the height, instead of one half — albeit tentatively («rovna 1/3 šířky listu», my emphasis). The differences to naked eye comparing with the usual design are too great not to consider this an error. 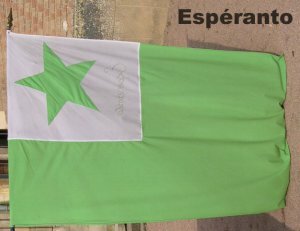 In the a collection of world flags assembled by Priest Legros shown in the castle of La Palice in Lapalisse, France, the flag labelled as of Esperanto has a rectangular canton and the star tilted. Apart from the wrong canton and star tilt, the shade of green is way too light. I wonder where the Abbey got hold of this variant, it seems manufactored, there should be more of it around. A word of caution about this design, in (6+3):(6+6) ratio: It is my reconstruction based on the description taken from [rod97], and even if it is accurate, it must have been replaced by the current version, in (1+1):(1+2) ratio, very early, for I never saw photographic or other evidence of any significantly different design used later on. The new jubilee symbol (jubilea simbolo), was chosen in contest by the Universal Esperanto Association while preparing the first centenial of the language, in 1987. Called derogatively by some as the melono (mellon), it was designed by a Brazilian esperantist. Universal Esperanto Congresses are held in a different city yearly since 1905 (with gaps for both World Wars) and since about the mid-1960ies each congress has a logo, usually including local city symbols along with the an Esperanto symbol, host city name and the words "nn-a Universala Kongreso [de Esperanto]" ("nn" standing for the congress serial number; 2007 will be the 92th, in Yokohama). (Full list here.) 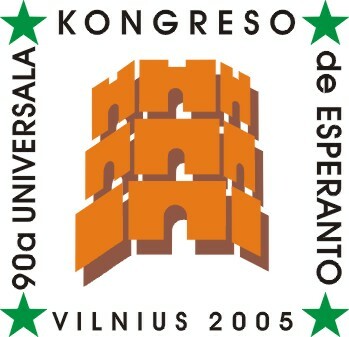 These logos however almost never made it to flags, somehow; a single exception was the 90th Universal Esperanto Congress, held in 2005 in Vilnius. There may have been other such flags, but this is the only one I ever found. Universal Esperanto Congresses are the usualy largest gatherings of Esperanto speakers worldwide (typically 2000-4000 participants) and still give place for formal and solemn events more and more missing in other, smaller Esperanto meetings the year round. Even so, an Esperanto flag is an often sighting in venues of any larger speakers’ meeting. 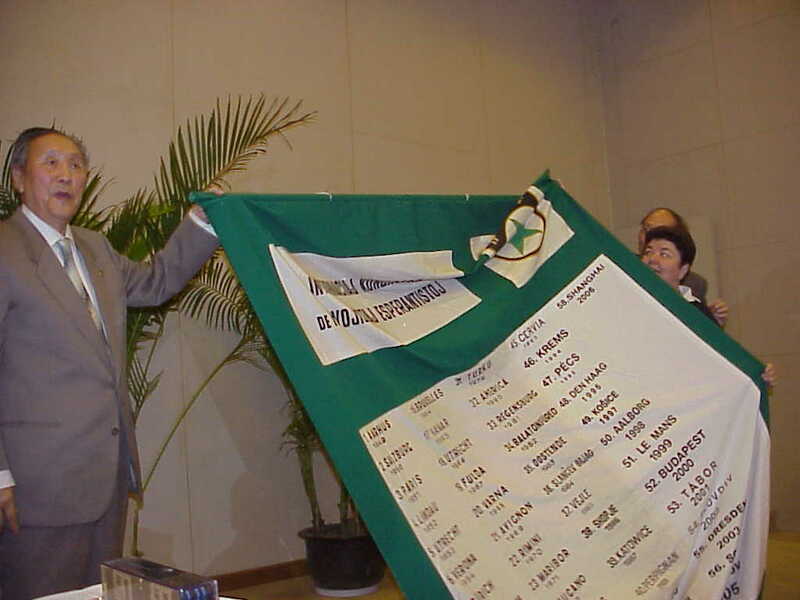 Incidently, I found examples of such use also in smaller gatherings: At the 38th Brazilian Esperanto Congress in Belo Horizonte, 2003, and at the 58th Congress of the International Railroad Esperanto Federation, in Shanghai, 2006, both with past congress patches stitched to the fly. A photo (here, here and here) shows the national flag of Lithuania, the flag of Esperanto and a white flag with the logo of the 90th Universal Esperanto Congress, held in 2005 in Vilnius. SAT (Sennacieca Asocio Tutmonda) is a political organization for left-wing esperantists, encompassing all tendences except (until recently) communists (marxist-leninist and maoist sorts). Its usual emblem is a green star fimbriated red. This photo shows a congress of SAT in 2004 in Bratislava. It shows the red Esperanto flag with additional lettering "S.A.T." in black capitals above the star, where there seems to be extra white space for it, making me believe that this is specially manufactored to include the lettering, these therefore not being added later on. In this vintage drawing yet another SAT flag, but on an old black-and-white linedraw image, showing an esperanto flag (maybe red, maybe green) with the word "SAT" on the star. Some Esperanto organizations use the flag in variants defaced with organization names and slogans, written on the bottom half of the flag. Such is the flag of Japana Esperanto-Instituto (Japanese Esperanto Institute, a Japanase non-profit NGO), as seen on the background of a giggling scene of this summer’s Children Esperanto Congress. The exact proportions of this flag may be slightly longer than the official 2:3.